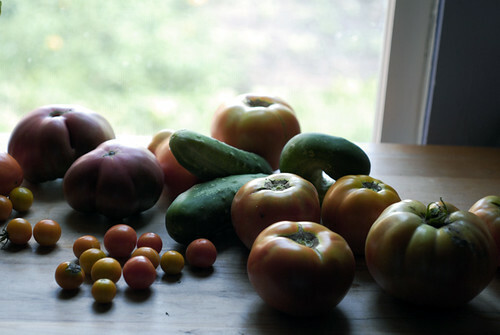 Last week when I took the above film shot the tomatoes were just beginning to ripen. Then last night M. brought in this haul, below. I see lots of tomato, mozzarella, basil with balsamic vinegar in the near future. The cucumbers are also prolific, but I think they're about to slow down. Yet the squash and zucchini are producing like gangbusters so I'm looking for recipes to use them up. There's a recipe variation for zucchini muffins in a Moosewood cookbook I want to try. And the other night I made this tomato zucchini tart of Rachel's, which is so good. You've got to try it. And twice (to use the cucumbers and tomatoes) I've whipped up a summer salad from the recent issue of Vegetarian Times which has a garlic and basil dressing poured over freshly chopped red onions, cucumber, and tomatoes. It's simple, cool and flavorful, just right for these hot humid days. Do you have a favorite tomato, cucumber or squash recipe?